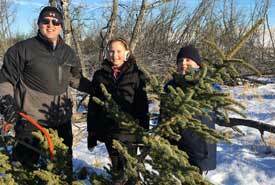 This winter, Nature Conservancy of Canada (NCC) staff and volunteers in Saskatchewan held a Christmas tree harvest. The event aimed to help tackle invasive spruce trees at the Messier property, near Saskatoon. It was also an opportunity for volunteers to take home a free tree. Coniferous (evergreen) trees do not typically occur this far south in the Aspen Parkland ecoregion. In fact, their presence may negatively affect habitat for the plants and animals that live there. Spruce trees may alter the soil chemistry when they shed their needles. This makes the soil more acidic and inhospitable to many plants. Spruce trees also provide refuge or corridors for animals that may not otherwise occur in the area. Altering the species composition of animals on the landscape may be favourable for some, but unfavourable for others. "Removing the spruce trees will help return ecological integrity on the Messier property and restore it to its former glory," says Matthew Braun, manager of conservation science and planning for NCC in Saskatchewan. This event provided volunteers with an opportunity to escape into nature during the winter, help remove invasive species and bring home a Christmas tree.